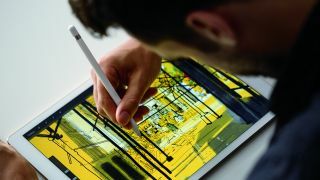 Can't handle the 12.9-inch iPad Pro screen, but find the 9.7-inch model's dinky canvas too cramped for your creative vision? Then hold out just a little longer – rumor has it that Apple has a 10.5-inch version waiting in the wings. That's according to insider knowledge from Rhoda Alexander, Director Tablets and PCs, at IHS Markit, speaking to Forbes. Sitting between the two current models on the market, the attraction to the 10.5-inch version will be the fact that, despite the extra screen real estate, it'll actually be no bigger overall than the 9.7-inch edition. It'll achieve this by shrinking down the device's bezels even further than what Apple currently offers. However, this will change the device's screen ration, according to DisplayMate Technologies' Raymond Soneira. The iPad currently sits at a 1.33 ratio – the new design could shift that to as high 1.50. This may necessitate different app builds to fill out the new screen shape, fragmenting Apple's tablet app ecosystem. That's something that Apple would be keen to avoid, which may rule out this rumor. Still, it's claimed that the mid-sized iPad Pro would still retain the range's super-sharp pixel density by upping the resolution to 2,224 x 1,668. A value-orientated iPad is also rumored, expected to come in at a lower price than the iPad Air 2. Which internals would be powering it are not currently clear, but it's assumed they'd be an older generation in order to drive the price down. The latest rumors point to a March reveal for the new iPad range, so we may not have long to wait to find out whether these whispers ring true.